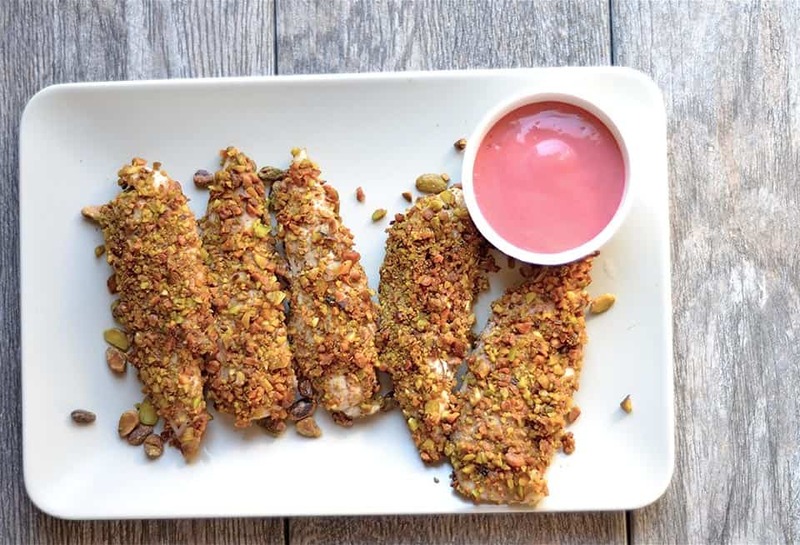 Chicken tenders crusted in chopped pistachios, baked until crispy, and dipped in a raspberry mustard sauce. 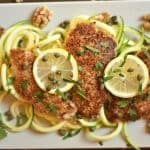 A simple and easy dinner the whole family will enjoy! I hesitate to compare these to a chicken nugget, but if you’re looking to sell these to your kids, it’s pretty easy. 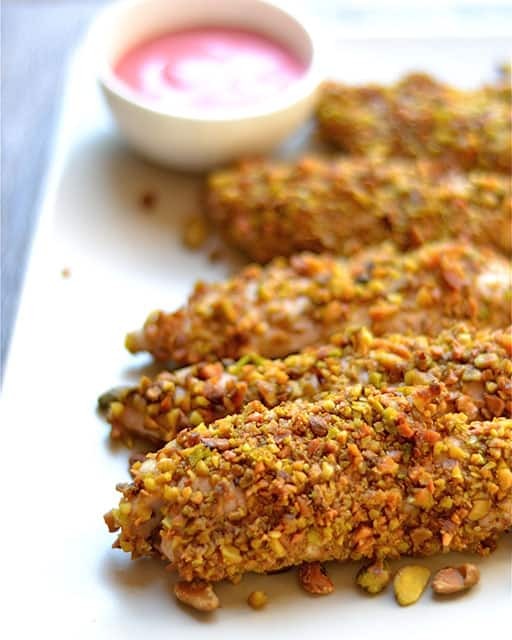 The pistachios create a crusty shell that kids will love. 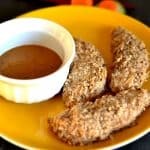 The raspberry honey mustard dipping sauce is also an added bonus! 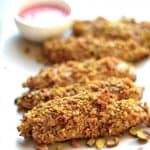 These tenders are packed with nutrition, and create a much better alternative to any processed meat. 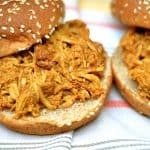 These are also easy to prepare, and can be made in advance! Transfer to a shallow baking dish and bake until crispy! We served these along side some sweet potato fries and a side salad. Preheat oven to 350. Grease a shallow baking dish. Pat and dry chicken breasts, remove to the side. Place shelled pistachios in a shallow wide bowl or plate. Using a blender, mix together mustard, oil, raspberries, water, and honey. The sauce should be pretty thick. Remove about 3/4 cup sauce and set aside. Add an additional 1/4 cup water to the remaining sauce, and thin it out. Place thinner sauce in a bowl. 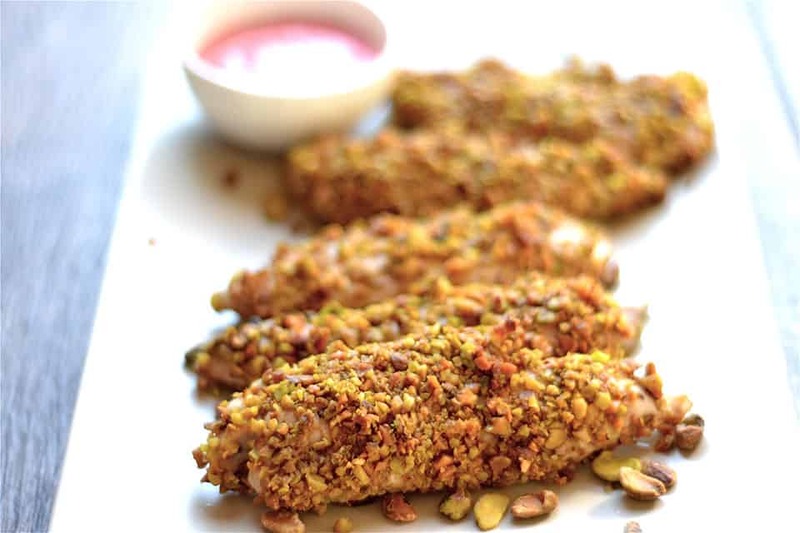 Dip each chicken breast in thin sauce, remove any excess, and place in bowl of pistachios to coat. Place each chicken tender in the shallow baking dish. Bake for 25 minutes at 350. Serve with the thickened raspberry mustard. You can either finely chop the pistachios or pulse in a food processor or blender. This is a winner winner chicken dinner! The flavor combo for the chicken in UNREAL! Thanks Bethany!! Glad you enjoyed it!! 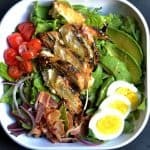 Do you know the macros on this recipe by chance? Yes, 25g protein, 13g carbohydrates, and 22g fat per serving. 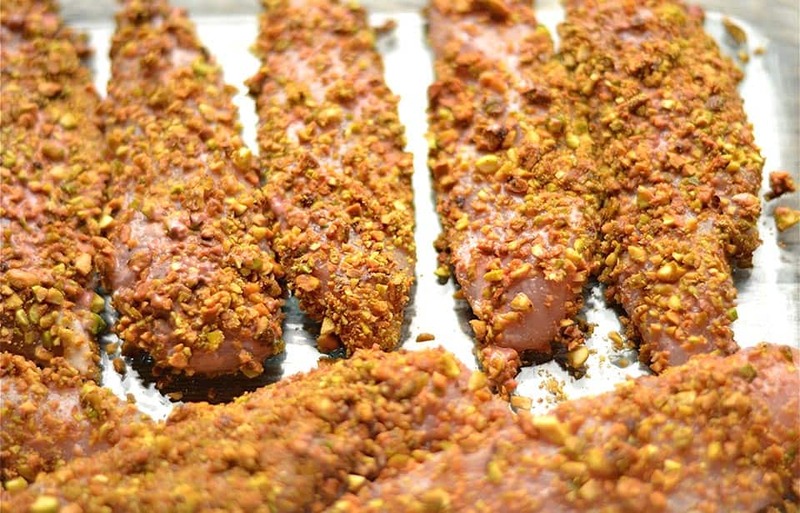 This recipe was sooooo amazing and so incredibly easy! Thank you so much!!!! YAY!!! Glad you loved it!